Embarking on a new construction project requires many decisions by project team members and owners — everything from budget and schedule concerns to long-term maintenance and utility costs. Today’s savvy owners have access to more information than ever before when undertaking a project and yet they are faced with more confusion and challenges because of that volume. A focus that used to be on financing, fulfillment and life-cycle costs; today’s owner now must be aware of indoor air quality (affected by volatile organic compounds or VOCs), raw material depletion and recycled content among many other new concepts. This new frontier of data acquisition and decision making evidences that owners are pursuing sustainable projects at a dramatically increasing rate. Beyond the societal benefits of designing and constructing sustainable facilities, owners desire a sustainable structure to reduce both short-term costs by incorporating recycled materials and long-term operating costs by selecting better building systems for their facility. Concrete is a sustainable construction material that is commonplace throughout the built environment, even before the green and sustainable building movement took hold. Offering the attributes of durability, low maintenance, local availability, high strength and no impact on indoor air quality, concrete can be used on every type of end-use facility. Site-cast Tilt-Up offers not only these attributes, but many more that make it an optimal solution for sustainable construction. In addition to the natural beauty of concrete, Tilt-Up construction offers the versatility to reduce environmental impact by offering smaller footprints and stacked structures, resolving urban infill and reducing the required site area for construction. Beyond design and the versatility of Tilt-Up, local material acquisition and the use of the building site for production can reduce the carbon footprint and carbon dioxide emissions. Wall sections are thinner and material is used more efficiently as structural components resulting in less materials delivered to the jobsite and less waste generated during construction. The horizontal casting surface for vertical panels also greatly reduces the forming material requirements. Both virgin material demands and consumption of landfill space are reduced through the use of Tilt-Up concrete. Similarly, transportation costs, fuel consumption and therefore carbon output are minimized through the reduction of vehicles traveling to the site to deliver materials or remove waste. In addition, the speed of construction afforded by Tilt-Up leads to less vehicles and machines being used during construction when compared to other construction methods. A specific benefit to contractors, developers and owners is a savings in fuel costs. Sustainable construction focuses in part on the concepts of recycle and re-use. Tilt-Up construction applies these concepts in several ways. The principle of recycling is achieved during construction through the use of recycled materials found in steel reinforcement, large and small aggregates. The principle of recycling is achieved during construction through the increasing array of supplementary cementitious materials such as fly-ash, slag, foundry sand, limes sludge and silica fumes. The principle of reuse is achieved as Tilt-Up buildings are more easily expanded during renovations or adapted for reuse. The principle of recycling is achieved during renovation, remodeling or demolition as Tilt-Up wall panels are crushed and used as the sub-base for sidewalks, parking lots, casting slabs or roads. Similar recycling occurs with the temporary slab conditions used to cast the panels. 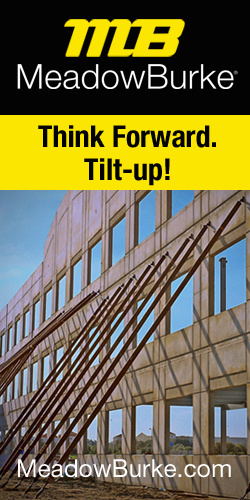 Once the panels are erect, Tilt-Up continues to offer sustainable benefits through greatly reduced mechanical system requirements. 1. The large panel size means joints are minimized, which limits air infiltration. 2. As compared to other systems, Tilt-Up panels provide a lower level of permeability of air as well as loss of conditioned indoor air. 3. Proven insulation systems provide uncompromised, continuous insulation layers. Developed specifically for Tilt-Up construction, they provide the maximum energy efficiency possible. Structures created with insulated wall panels are not affected by the daily temperature fluctuations; thus, lowering both cooling and heating costs, providing comfort for the owners as well as the occupants. 4. Thermal mass inherent in the structural concrete layer establishes a dampening effect to the diurnal temperature cycle the building experiences. Combined with the continuous insulation systems in a sandwich wall design, the thermal mass produces a building envelope performance that is unparalleled. 5. Through exposed concrete interior surfaces, indoor air quality can be improved by reducing VOCs and lowering maintenance requirements. Concrete itself is a non-offgassing material, so it qualifies as low VOC. 6. Natural concrete surfaces can be designed to actively absorb carbon dioxide from the air through carbonation and can self-clean oxidized organic matter with certain additives. Since natural concrete surfaces, or additive enriched concrete, can help clean the air and reduce the risk of Sick Building Syndrome (SBS) and Building Related Illness (BRI), the need for high-maintenance carbon filters may not be required. 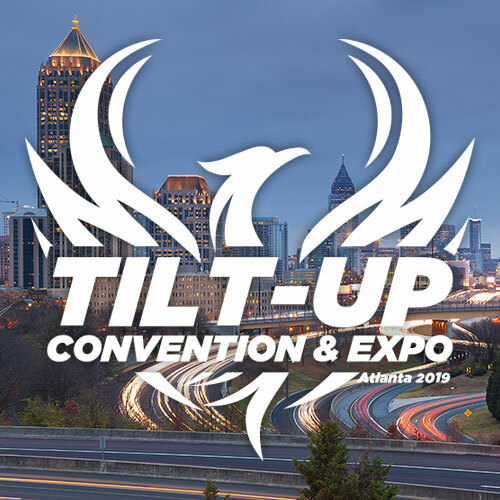 Tilt-Up professionals have actively begun promoting the method’s sustainable attributes as evidence by several of this year’s 2010 Tilt-Up Concrete Association (TCA) Achievement Awards. Winner of the Excellence in Achievement distinction, One Haworth Center is a 300,000-square-foot office building and renovation in Holland, Mich.
Intended to make a statement to their worldwide customers, the One Haworth Center renovation and addition was originally designed with a 54-foot tall cast-in-place concrete wall along one side of the portion of the building termed “the bookend.” This unusual part of the building resembles a bookend because of its sloped and planted green roof, and tapered shape in plan. Up to 8 feet of this concrete wall is located below grade, supported on a cast-in-place retaining wall that forms one edge of an HVAC tunnel below the slab-on-grade. The design and construction team brought in Steinbicker and Associates of Dayton, Ohio, an engineer with a specialty in Tilt-Up, to facilitate the conversion of the cast-in-place wall to Tilt-Up; a value engineering conversion that ultimately saved the owner more than $200,000 and more than one month in the construction schedule. The original architecture incorporated reveals and form tie “cones” into the exposed finish for the cast-in-place walls; these elements were also cast into the Tilt-Up panels during construction. Other unique architectural features include full-height diagonal windows and a sloped top on the panels. While the window layout provides much architectural interest, it made the conversion to Tilt-Up somewhat difficult. The window layout dictated that some panels would be less than 3 feet wide at their base and more than 16 feet wide at the top, a panel geometry that would be unstable for erection purposes. For this reason, in several instances, multiple panels were temporarily tied together across the windows to create panels that could be erected safely. To accomplish this, temporary recessed horizontal concrete beams were added across the openings. These tie beams also acted to transfer the lifting forces from one side of the diagonal opening to the other, thus minimizing the differential deflections between the two sides of the panel during erection. Overcoming the effects of a full-height vertical depression in some of the panels, which reduced the structural thickness down to 5.5 inches, was the final challenge. This LEED registered building is classified as NC Gold by the U.S. Green Building Council. When one of Florida’s largest wholesale beverage distributors grew too large for its current location, site-cast Tilt-Up construction was the natural choice for the construction of a new facility in Tampa, Fla. As one of the top wine and spirits providers in the United States, Premier Beverage challenged the R.R. Simmons design-build team to not only construct a large industrial facility, but also have the building qualify for LEED certification. also features a 50,000-square-foot corporate office to handle Premier Beverage’s West Florida operations. As a distributor of fine wines, Premier Beverage also incorporated a 60,000-square-foot, air-conditioned area within the warehouse specifically for wine storage. This large-scale project required 24,000-cubic-yards of concrete and nearly 49,000 tons of steel. With a building size the equivalent of 12 acres under a single roof, the R.R. Simmons design-build team had more than enough casting area to start panels while still grading the building pad in other locations. By phasing the project, R.R. Simmons was able to keep the project on track and complete the facility in just over 10 months. Adding complexity to this already challenging project was Premier Beverage’s desire to have an envi- ronmentally-friendly facility. A family-owned business, Premier Beverage is the second largest wine and spirit firm in the United States. They wanted a facility that could withstand the rigors of their operation, yet still lower their energy footprint. Concrete and Tilt-Up played a pivotal role in the project obtaining LEED Silver certification. Recycled goals were improved because the design-build team was able to recycle casting beds for the sub-base and other uses. The team studied transportation issues and determined the on-site casting of the Tilt-Up panels further lowered their energy consumption and transportation costs when compared to other systems. By using exterior panels for loading, the team lessened the structural steel consumption, which saved energy in the production of steel and the transportation from outside of the Tampa market. Another important factor in the decision to pursue LEED was the proximity of the site to a conservation area that housed a family of eagles. This adjacent site forced all the parties involved on the project to focus on the environmental impact of the project. The benefits of Premier Beverage’s decision to build an environmentally-sensitive facility have been numerous. Not only did the building receive the U.S. Green Building Council’s Silver LEED Certification, but it was recognized as one of the South’s largest LEED facilities. One important green feature of this project is the incorporation of a bright white thermoplastic olefin (TPO) roof, which incorporates a highly reflective material that will minimize the heat absorption from Florida’s tough solar conditions. Working in concert with the users, the design-build team also implemented a smart lighting program. Motion sensors minimize the energy consumption of the facility. Additionally, the elevated lighting program places the most effective lighting solutions at specific points to provide the picking workforce with optimal clarity and reduce errors. This project had a substantial benefit to the community. New jobs were created both during the construction process and when the company opened the doors. “The design-build team took a marginal site and vastly improved the storm water issues for the area, as well as the water quality of the runoff,” said Simmons. The Premier Beverage facility’s energy footprint has been drastically reduced from what would have been done if LEED would not have been investigated. “All parties involved with this project worked together to develop creative ideas to meet LEED goals, schedule constraints and ensure the state-of-the-art nature of the facility,” said Simmons.